Electrophoresis is used for the separation of charged molecules like DNA, RNA, or proteins by an electric current applied to a gel matrix. In PCR applications it is usually done for separation and visualization of DNA after PCR. The nucleic acids have a negative charge due to the sugar phosphate backbone of the molecule. This allows movement from the negative to the positive electrode. Acrylamide gels are most suitable for separation and resolution of DNA molecules that may differ in size by only one base pair. The acrylamide gels can withstand high temperatures and hence are suitable for applications requiring high voltage. 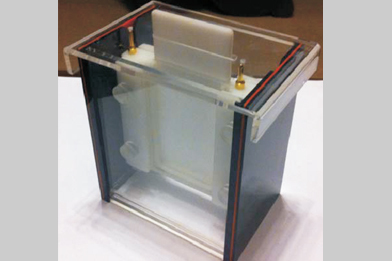 Acrylamide gels are typically run in a vertical position using discontinuous buffer compartments. GTI-Midi PAGE tank is designed for resolution of DNA fragments differing in size up to 2 base pairs. Copyright 2015 GTI-Midi PAGE TankGenetics Resource Centre .